Each year, 20 to 50 million people are injured in car accidents. In Fresno, there were 1,788 injuries involving motor vehicles in 2015 alone. Some of the most common injuries involve the head, back, and neck along with foot and knee joints. A seemingly minor injury, when left untreated, can turn into a chronic problem down the line—causing pain and even disruption of work and daily activities. That’s why it’s important to get treatment if you’ve sustained an auto injury—even if you feel okay. Chiropractic care has a proven record treating sustained auto accident injuries. One study confirmed that seeking early treatment greatly improved patient outcomes, so the faster you can get to your chiropractor’s office, the better off you’ll be. A chiropractor has eight years of in-depth education on the human body in addition to their undergraduate degree, including clinical experience and training. The science of chiropractic medicine hinges upon a comprehensive understanding of human anatomy and how your body’s systems interact. Because chiropractic manipulation works fast to reduce inflammation, patients are more likely to feel relief not just locally, but throughout their bodies. Best of all, not only does chiropractic care work, it doesn’t involve drugs or surgery. This means you’ll be more active, sooner. You’ve Been Injured – What Next? First, get evaluated by a professional. Dr. Jaime Reyna of Reyna Chiropractic Center in Fresno can determine the extent of the injury and treat you—the same day. Reyna Chiropractic Center's open-door policy means there’s no waiting, so you’re seen immediately. Dr. Reyna has been practicing since 1985, and has completed several specialized trainings that focus specifically on accident and disability recovery and evaluation. If you’ve been injured, he’ll not only treat your injuries, but can provide documentation you may need for subsequent claims for worker’s disability or litigation. Remember, the quicker you’re treated, the faster you’ll heal and the less problems you’ll have down the line. 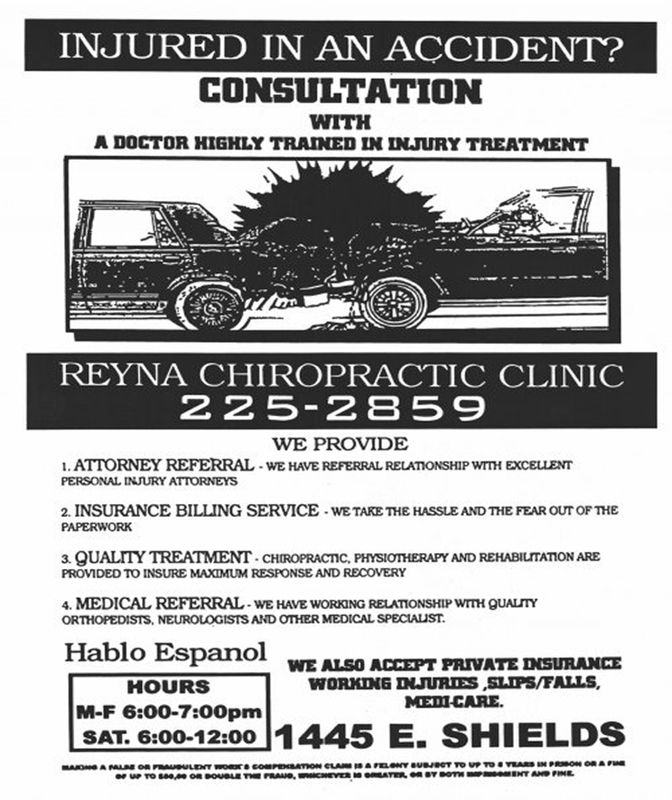 If you’re seeking a car accident treatment in Fresno, head to Reyna Chiropractic Center and take advantage of their walk-in policy to start feeling better – and fast.